Definition at line 2792 of file Stmt.h. Definition at line 726 of file Stmt.cpp. 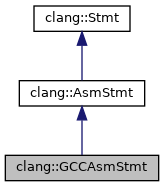 References clang::C, clang::AsmStmt::NumClobbers, clang::AsmStmt::NumInputs, and clang::AsmStmt::NumOutputs. Build an empty inline-assembly statement. Definition at line 2811 of file Stmt.h. AnalyzeAsmString - Analyze the asm string of the current asm, decomposing it into pieces. If the asm string is erroneous, emit errors and return true, otherwise return false. Definition at line 507 of file Stmt.cpp. References Begin, clang::ASTContext::getLangOpts(), clang::ASTContext::getSourceManager(), clang::ASTContext::getTargetInfo(), clang::TargetInfo::hasNoAsmVariants(), clang::isDigit(), clang::isLetter(), clang::Result, and SM. Definition at line 2961 of file Stmt.h. Assemble final IR asm string. Assemble final IR asm string (GCC-style). Definition at line 684 of file Stmt.cpp. Definition at line 2818 of file Stmt.h. Definition at line 2819 of file Stmt.h. Definition at line 2958 of file Stmt.h. Definition at line 424 of file Stmt.cpp. Definition at line 2953 of file Stmt.h. Definition at line 2954 of file Stmt.h. Definition at line 2959 of file Stmt.h. getInputConstraint - Return the specified input constraint. Unlike output constraints, these can be empty. Definition at line 449 of file Stmt.cpp. Definition at line 2919 of file Stmt.h. Definition at line 2922 of file Stmt.h. Definition at line 439 of file Stmt.cpp. Definition at line 2929 of file Stmt.h. Definition at line 2906 of file Stmt.h. Definition at line 2910 of file Stmt.h. getNamedOperand - Given a symbolic operand reference like %[foo], translate this into a numeric value needed to reference the same operand. This returns -1 if the operand name is invalid. Definition at line 487 of file Stmt.cpp. getOutputConstraint - Return the constraint string for the specified output operand. All output constraints are known to be non-empty (either '=' or '+'). Definition at line 435 of file Stmt.cpp. Definition at line 2891 of file Stmt.h. Definition at line 2894 of file Stmt.h. Definition at line 428 of file Stmt.cpp. Definition at line 2900 of file Stmt.h. Definition at line 2880 of file Stmt.h. Definition at line 2882 of file Stmt.h. Definition at line 2813 of file Stmt.h. Definition at line 2820 of file Stmt.h. Definition at line 443 of file Stmt.cpp. Definition at line 2814 of file Stmt.h. Definition at line 2793 of file Stmt.h.